The Fusion 7 is the 7 sided version in Paragon's range of popular digitally controlled hot glass fusing kilns. The digital Sentry Xpress 3 key controller will make programming the kiln a very simple and accurate procedure. 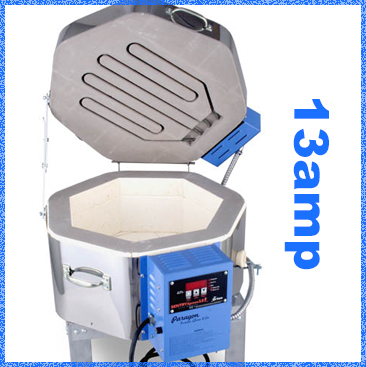 The controller is integrated onto the front of this kiln and will allow you to control both heating and cooling of your firing with a simple 3-key operation. Set the firing that best suits your own material and preferences, then save it as a program in the computer so next time you will not have to enter all the details again. The Fusion 7 comes with the added convenience of plugging into a standard 13-amp socket, so no wiring in needs to be done. The lid heating elements use a new element groove that eliminates the need for restraining element pins. The element coils are manufactured wider than the groove opening, so lodge into position without any need for pins, and cruically, minimal risk of any disturbing of the kiln brick during firing, which could create a dust can float around the chamber, landing on your ware. Comes with a years warranty on the kiln, 2 years on the computer, and our help whenever you need it!